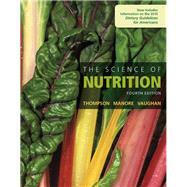 For introductory Nutrition courses for Majors. The Science of Nutrition offers the best combination of text and media to help students master the toughest nutrition concepts in the course, while providing the richest support to save instructors’ time. This best selling, thoroughly current, research-based nutrition text is uniquely organized around the highly regarded functional approach, which organizes vitamins and minerals based on their functions within the body and is easily seen in the organization of the micronutrient (vitamin and mineral) chapters. The 4th Edition enhances the student learning story with greater incorporation of learning outcomes throughout the text; an increased visual impact with the inclusion of new Focus Figures, including Meal Focus Figures; and a strong media story with new assets in Mastering Nutrition, including revised nutrition animations. Important hot topics and new research such as the latest dietary guidelines and Nutrition Facts panel, a revised global hunger chapter (to incorporate more coverage of domestic issues, including sustainability and environmental impacts, food equity, politics, etc. ), and updated science and source information make this one of the most current texts on the market today. Note : You are purchasing a standalone product; Mastering Nutrition does not come packaged with this content. MyLab is not a self-paced technology and should only be purchased when required by an instructor. Students, if interested in purchasing this title with Mastering Nutrition, ask your instructor for the correct package ISBN and Course ID. Instructors, contact your Pearson representative for more information. The Science of Nutrition , 4th Edition is also available via Pearson eText, a simple-to-use, mobile, personalized reading experience that lets instructors connect with and motivate students — right in their eTextbook. Learn more. Janice Thompson is Professor of Public Health Nutrition at the University of Bristol, England. Her work in the United Kingdom focuses on developing nutrition and physical activity interventions to reduce the risk for chronic diseases in high-risk populations. She retains her affiliation with the University of New Mexico through consulting on nutrition and exercise research with the Office of Native American Diabetes Programs at the University of New Mexico Health Sciences Center. While she was based at University of New Mexico, she conducted research on how nutrition and physical activity interventions reduce diabetes risk in Native American populations, mentored junior faculty in research, and taught nutrition courses. Janice is a Fellow of the American College of Sports Medicine (ACSM), a member of the American Society of Nutritional Sciences (ASNS), the Southwest Chapter of ACSM (SWACSM), the New Mexico State Diabetes Advisory Committee, and the American Diabetes Association (ADA) and the American Public Health Association (APHA). Janice won an undergraduate teaching award while a faculty member at the University of North Carolina, Charlotte. Janice is the co-author with Melinda Manore of Pearson’s non-majors nutrition book Nutrition: An Applied Approach and consumer-level nutrition book, Nutrition for Life. Melinda Manore is a professor in the Department of Nutrition and Exercise Sciences at Oregon State University, Corvallis, where she teaches and conducts research in nutrition and exercise. Before coming to Oregon State, she taught at Arizona State University for seventeen years. Melinda’s areas of specialization include nutritional requirements and issues for active women, nutrition assessment, and the role that nutrition and exercise play in health, energy balance, obesity, and disordered eating. A registered dietitian, Melinda is an active member of the Academy of Nutrition and Dietetics (formerly the American Dietetic Association). She is Past Chair of the ADA Research Committee and the Research DPG (Dietetic Practice Group). Melinda is a member of the American Society of Nutritional Sciences (ASNS), the American Society for Clinical Nutrition (ASCN), the North American Association for the Study of Obesity (NASSO), the National Academy of Sciences Committee on Military Nutrition Research, and a Fellow of the American College of Sports Medicine (ACSM). Melinda writes a nutrition column for and is an associate editor for ACSM’s Health and Fitness journal, and she has won numerous awards for excellence in research and teaching. While at Arizona State University, she was nominated for the Distinguished Mentor of Women Award (1996), and the College of Liberal Arts & Sciences Alumni Association Outstanding Teaching Award (1998, 2000). In 2001, she received the SCAN Excellence in Practice Award. Melinda is the co-author with Janice Thompson of Pearson’s non-majors nutrition book Nutrition: An Applied Approach and consumer-level nutrition book, Nutrition for Life. Linda Vaughan is Associate Dean at Arizona State University, East. Previously, she was Chair of the Department of Nutrition. Linda earned her doctorate at University of Arizona in agricultural biochemistry and nutrition. She currently teaches, advises graduate students, and conducts research about “independent living” older adults and the nutrient content of donated/distributed food from community food banks. Her area of specialization is older adults and lifecycle nutrition. Linda is an active member of the Academy of Nutrition and Dietetics, the American Institute of Nutrition/American Society of Nutrition Sciences, the Arizona Dietetic Association, and the Central Arizona Dietetic Association. Linda has received numerous awards, including the Arizona Dietetic Association Outstanding Educator Award (1997) and the University of Arizona East Supervisor of the Year award (2004).